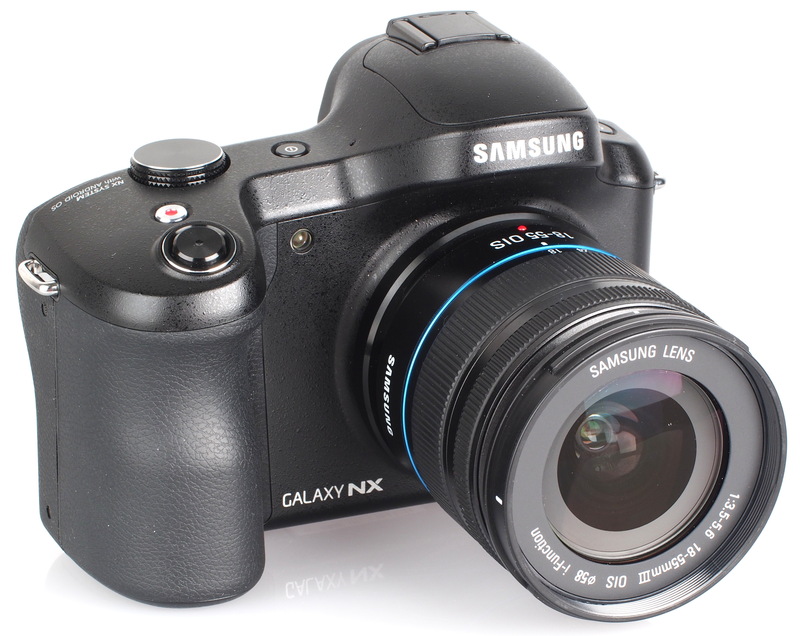 The Samsung Galaxy NX is the only mirrorless camera running Android, but how does it perform and is the price justified? Find out in our review. The Samsung Galaxy NX combines last year's Samsung NX20, with a quad core processor, a large 4.8inch touch-screen, electronic viewfinder, and the latest version of Android to provide a fully internet ready compact system camera, making it the World's first Android powered compact system camera. The Samsung Galaxy NX is available for £1299 with 18-55mm OIS kit lens. Samsung NX cameras use the Samsung NX lens mount, making this camera compatible with a range of Samsung NX lenses. 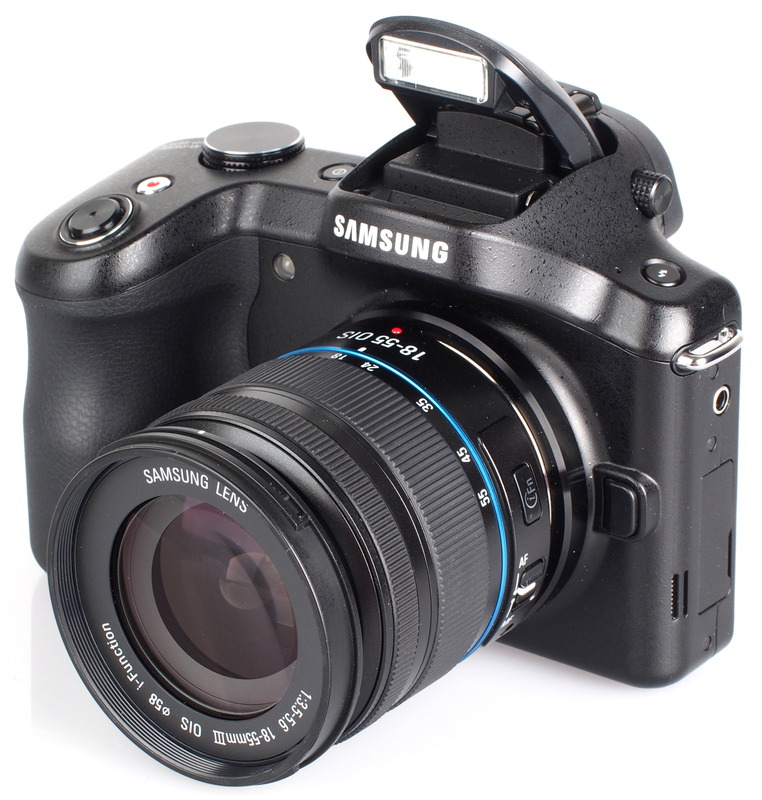 Like other Samsung NX cameras features a 20.3 megapixel APS-C CMOS sensor. Running Android, the camera has a MicroSIM slot so that you can use a data connection, or alternatively use Wi-Fi for sharing photos, or backup up to the cloud, with the provided Dropbox storage. You also have access to Google Play so can download as many photo apps, games or accessories as you'd like. The camera has 16GB built in, but can also be upgraded with a MicroSD card. On the side is a headphone socket as well as MicroUSB and HDMI connections so that you can connect the camera to a TV or use it with headphones to listen to MP3s or watch videos or iPlayer on the larger screen. Handling - The large 4.8inch screen on the back makes the Samsung Galaxy NX a noticeably large camera, and with a Digital SLR design, you'd be forgiven for thinking this was a Digital SLR, particularly as the width and height of the camera is roughly the same size as other traditional Digital SLRs. However, it is much thinner than most thanks to the mirrorless design. The large handgrip with a good sized rubber grip makes holding the camera quite comfortable when used with a decent sized lens, such as the 18-55mm OIS kit lens, although when used with a pancake lens, the camera can seem overly large at times. Build quality is very good with the camera feeling well built, and feels like it would survive a few knocks and scrapes. 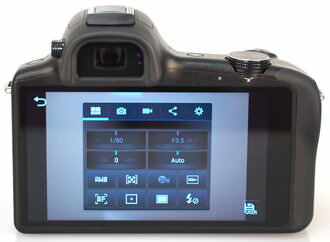 Physical controls, of which there are very few, include a flash button, on/off button, dedicated video record button, shutter release and control wheel. The control wheel can be pushed in and used as a button to select what you want to change, such as ISO, exposure compensation, shutter and aperture, and then turned to change the setting. However, for people who would like to use the camera in manual mode, it's a shame there aren't two control wheels, one at the front as well, as this would aid changing settings. 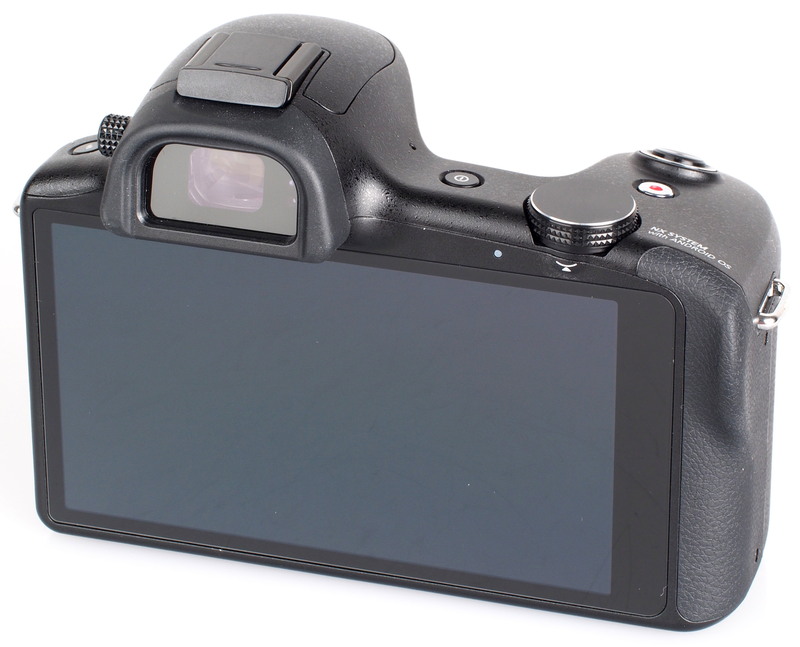 Although you can use the iFn button on the lens as another method for changing settings. The EVF has built in eye-detection and dioptre correction, and will automatically switch from the rear screen when held up to your eye. The electronic viewfinder is clear and sharp with good colour. The eye-piece is rubberised with a tough rubber, and can be removed once you move the flash hot-shoe cover out of the way. The large touch-screen makes it easy to change settings on the screen, as well as select the different shooting modes, and scene options. However we found it was often quicker to push in the control wheel on the back and use it to set exposure, exposure compensation and ISO. In order to use the quick control panel, shown above left, the camera needs to have the "Professional" mode switched on, which gives quick access to a number of settings. Battery life - Battery life is rated at 440 shots according to Samsung / CIPA test results. There are a number of settings available to increase battery life, however, as an Android system, the camera is generally in a state of standby, even with "off" or "Powered Down", meaning that you can start up the camera more quickly. The fast startup option, ensures a quick startup if used again within a 24 hour period, however when off for longer or the battery is taken out, startup is much longer at around 22 seconds. 3 seconds from "Power Off"
Continuous shooting is good with up to 19 shots taken before slowing down, at 8fps when shooting JPEG images. When shooting raw, it is only able to take 5 shots before slowing down. When shooting raw or raw and JPEG, if you change settings such as ISO, then take a photo, you can wait between 35 seconds and up to 4 minutes before it will let you change settings in the menus, although you can still take more photos. With review switched off, the camera is quicker but can still have these long delays. Shooting and recording to the internal memory seemed to improve speed slightly, although shooting JPEG only seemed to be much better. If you use manual focus, it often resets the focus you have set, so you need to re-focus it again. Set the focus point with the touch screen, the next time you go to take a photo it will jump back to the centre point or multi-area focus (depending what you have set). Sample Photos - Colour and detail are very good to excellent in good light, and portrait photos taken with flash are free of red-eye. Exposure is reliable, although at times exposure compensation can be needed to tweak the look of the photos, and avoid over-exposure of bright subjects. Dynamic range can be extended using the Smart Range or HDR options, with the HDR option taking three photos at different exposures and combining them. Focus in low light can struggle, more so the darker it gets, but the focus assist light can help here. Lens Performance - Detail is good, with the 18-55 OIS kit lens performing well for a kit lens, although images are slightly soft towards the extreme edges and corners. The lens is resistant to flare, and the provided lens hood helps here. There is very little chromatic aberration, purple fringing or vignetting visible, and minimal barrel distortion, although there is quite noticeable pincushion distortion at the telephoto end even with the distortion correction switched on. Macro focus can be difficult, with the camera mostly refusing to focus on close subjects, unless you either use manual focus (where you can get much closer), or start at a distance away and slowly bring the camera closer and closer to the subject re-focusing each time you move slightly closer. You can get quite close to the subject using the 18-55mm kit lens. ISO Noise Performance - Detail in images is good up to ISO800, and noise is well controlled at these lower ISO settings. Noise is still low at ISO1600, although detail is also low. Impressively noise is even low up to ISO3200 and ISO6400, although detail disappears much quicker than we would have hoped. Out of all the ISO test images, and even though it was set to raw and JPEG, it only saved one raw file to the MicroSD card, meaning the raw files were lost. White Balance Performance - Auto White Balance (AWB) performs well when shooting in tungsten and fluorescent lighting. The tungsten preset gives a similar result, while the fluorescent presets give a noticeable colour cast. Shooting these shots with the camera set to JPEG and raw the camera recorded JPEG and raw for five out of the 6 photos. Panorama mode - Panoramic mode lets you simply press the shutter release button and pan the camera from one side to the other, with the camera automatically stitching the photo together as you go. This works well, however the resulting photo is rather low resolution, it also doesn't save any EXIF information with the photo. Effects: Vignette, Greyscale, Sepia, Vintage, Faded colour, Turquoise, Tint, Cartoon, Moody, Fisheye, Negative, Nostalgia, Engraving, Sketch art, Downlight, Blue wash, Yellow glow, Sharpen, Blur, Soft glow. Portrait: Red-eye fix, airbrush face, face brightener, out of focus, beauty face (enlarge or shrink eyes, nose, mouth, face shape), spot healing. As well as these there are Cartoon style stickers, Drawing and Frames. The effects can be applied over the top of each other and can create some creative looking photos without having to use a computer or additional app to edit photos. However we would have to advise against using this for any serious editing as it saves the edited images as 1280x853 PNG files. Images edited in this way are also stripped of their EXIF information. 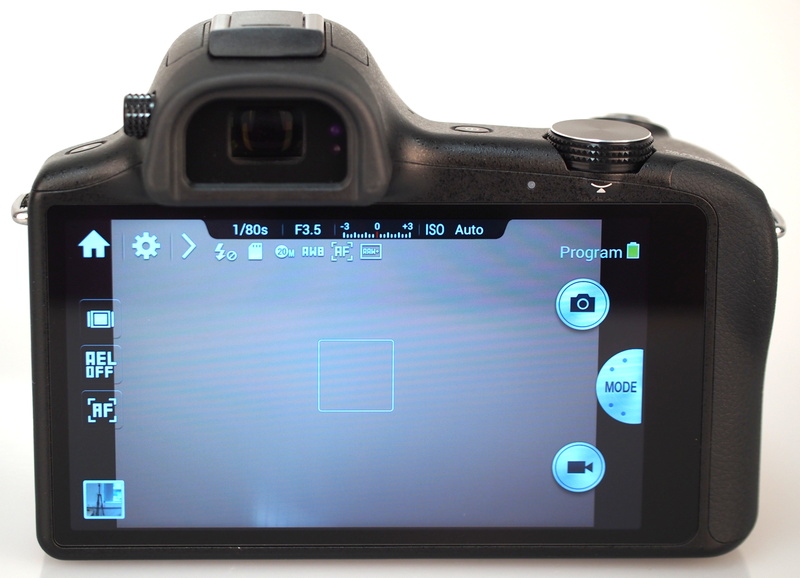 Video - Press the video button on the rear screen or the video button and video recording will start straight away. The camera records 1920x1080 video at 25fps, or 1920x810 at 24fps. 50fps is available when recording 720p video, and windcut is available. Quality is decent, although for best results a tripod or steady hands are recommended. Sony NEX-7, 24mp, EVF, £819 with 18-55m lens. Sony NEX-6, 16mp, Wi-Fi, EVF, £585 with 16-50mm lens. Olympus OM-D E-M5, 16mp, EVF, Weather sealed, £938 with 12-50mm lens. Panasonic Lumix GX7, 16mp, Wi-Fi, EVF, £899 with 14-42mm lens. Panasonic Lumix G6, 16mp, Wi-Fi, EVF, £533 with 14-42mm lens. 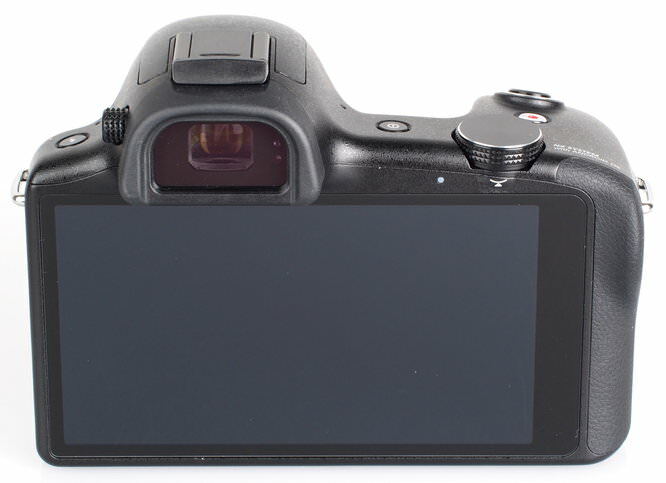 Panasonic Lumix GH3, 16mp, Wi-Fi, EVF, Weather sealed, £869 body only. Fujifilm X-E1, 16mp, EVF, £889 with 18-55mm lens. 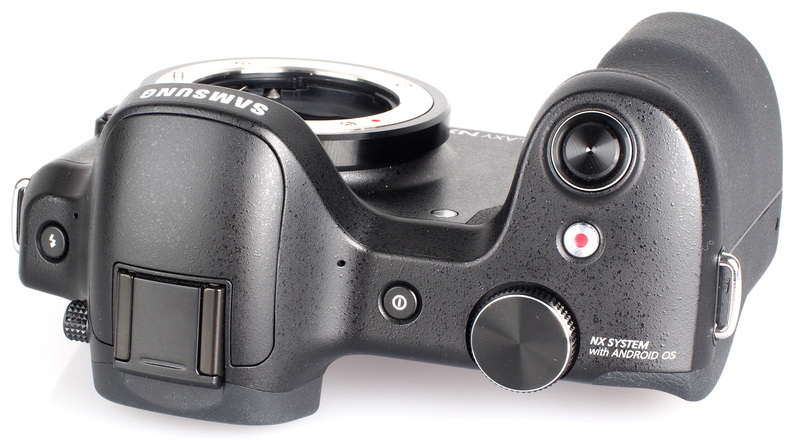 Samsung NX20, 20mp, Wi-Fi, EVF £479 with 18-55mm lens. For the gadget obsessed, where money is no object, this camera can work well, particularly as a point and shoot camera. If you simply point and shoot without changing many settings, and shoot in JPEG only, you will be extremely pleased with the high image quality this camera produces. You also get access to a good range of Samsung NX lenses, and the large 4.8inch screen on the back is simply gorgeous, the best on any camera currently available. With Android, Wi-Fi, and a MicroSIM slot it is extremely easy to share photos straight to the internet, and with 50GB of Dropbox storage provided, as long as you have a reliable internet connection you could use this as a backup destination for all your photos. However, for anyone who shoots raw, this camera could end up being extremely frustrating, or for those that regularly change settings, with long delays possible it could result in missed shots. With the high price, you would expect advanced amateurs to be purchasing this camera. Or perhaps professionals thinking they could shoot for example a wedding or other social event on location, and then quickly upload photos for the couple or guests to view on Facebook, but I wouldn't recommend anyone use this camera for professional work, due to the general slowness, failure to write raw files to MicroSD, and the camera locking up after settings have been changed. If you shoot with manual focus, or regularly want to fix the focus point to a specific point, then this could also be a problem as the camera has a regular and annoying habit of forgetting your last settings regarding focus. Something that just shouldn't be happening in a camera costing this much, and we hope there is a firmware update designed to fix these problems. Another issue is the price, which to us seems excessively high, at £1299 with 18-55mm OIS kit lens, alternatives could include the predecessor, the Samsung NX20 for around £479 (or the Panasonic Lumix G6 with Wi-Fi for £533), and for the Android functionality you could buy the Samsung Galaxy S4 for around £449 sim free, and you'd still have over £350 left over in change. If you already have an Android or iOS smartphone, then all you need is a camera with Wi-Fi, of which there are many, and you can send the photos, edit them, and then upload them from your smartphone, which in some ways would make more sense, as adding a data sim to the Samsung Galaxy NX would cost more money still. 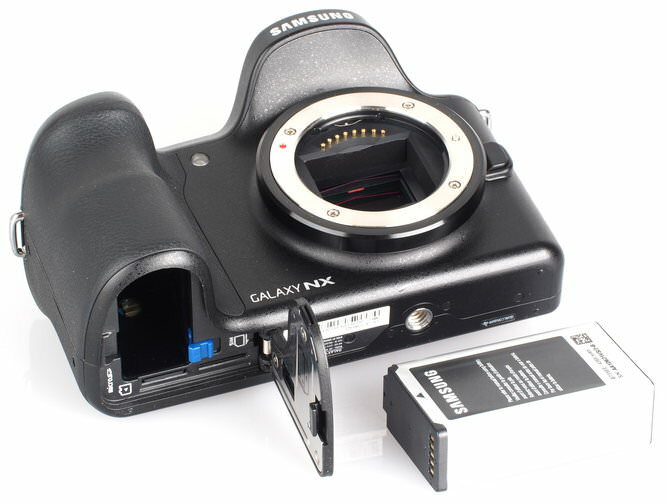 If you have the money, and a firmware update is able to resolve the issues we've experienced, then the Galaxy NX could be worth looking at, particularly if the idea of a camera running Android appeals to you. So relieved to read this report - I thought the 3 minute plus lock-ups might be me or my camera, so I'm 'glad' to know they all do it. Unfortunately it makes the camera all but unusable, at least in RAW mode, and it is distinctly slow in other ways too. I really don't think they should be selling these cameras with such poor performance, especially at such a high price. Batteries also seem completely unobtainable (I can't even find them listed anywhere, let alone available). I'll continue using the Olympus E-M5, and the Samsung will be put away until (I hope) Samsung issue some sort of firmware update to address the worst of the problems. 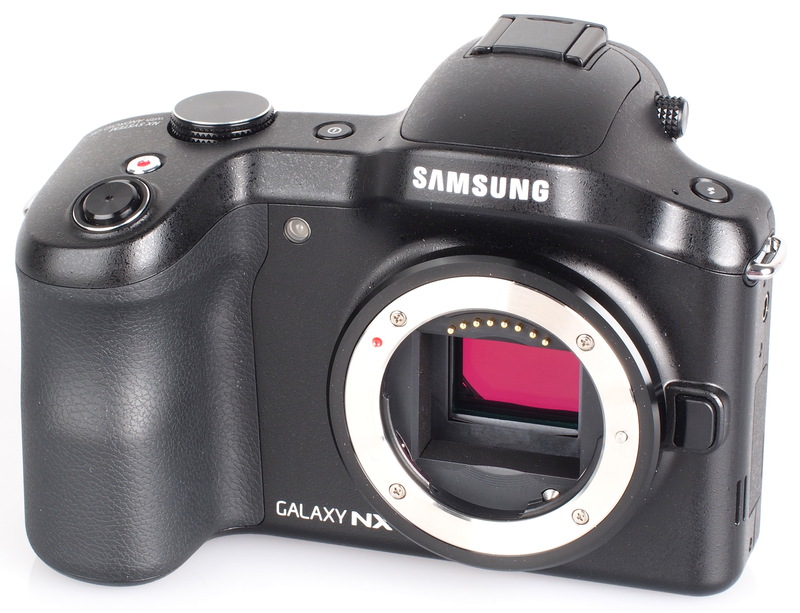 What about Samsung NX 300. Would you please consider reviewing it as well? I don't see why a 'serious' photographer would buy a camera like this. It's for gadget freaks with serious money to spend, and its minimalist lines may appeal to the trendy, but that's it. If my memory serves me right after NX10 there was NX11 and NX20 (or NX30??) the previous model with the physical buttons rather the superficial was a very tempting little gem. I think it may be still sold in some countries. This one looks is too curvy.